Cruising and…Crashing! – Run. Ride. Roam. We love the Netherlands! We keep saying that to each other, because it’s such a beautiful place and we are enjoying everything about it so far. 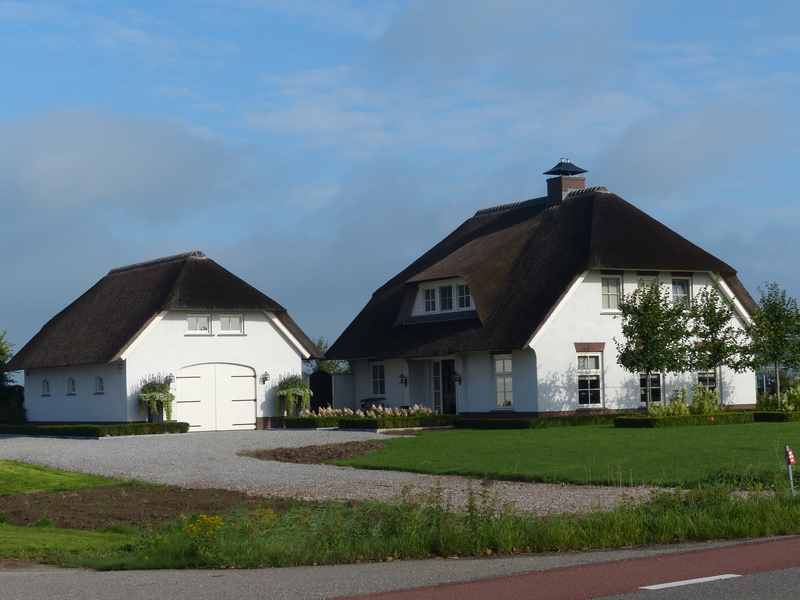 We made an early start this morning and set off in the cool of the morning, heading towards Tiel. 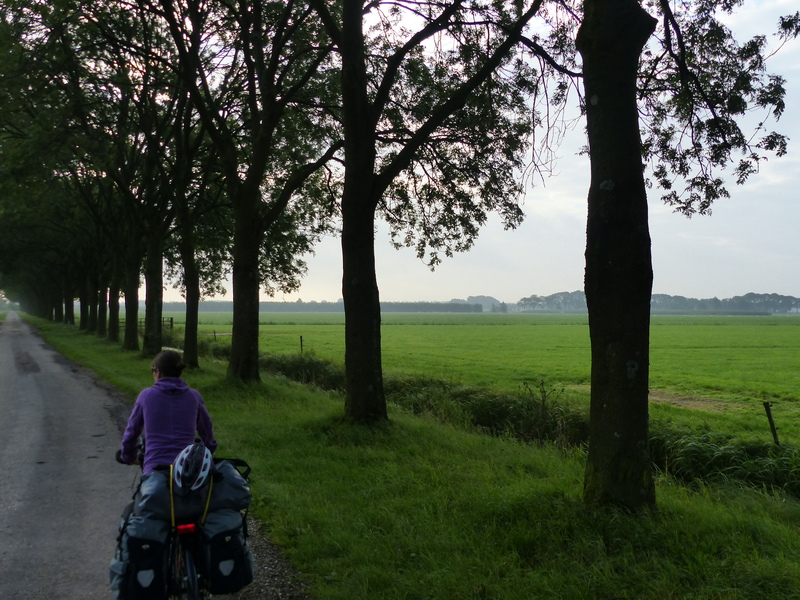 Once again, we had cycle paths to ride on and we cruised along the long stretches of flat tarmac, with that beautiful scenery either side of us. Every so often we would join up with a road, but they were quiet, country roads and the traffic was minimal and the drivers careful and patient, so it was all terrific. You know you’re in a cycling country when the roads have two lanes for cyclists and one for cars! Many of the roads and streets are like that. If there isn’t a dedicated path for bikes and they have to be on the road, there’s often a cycle lane on either side of the road, leaving only a single lane down the middle for the cars coming in both directions. This means cars frequently have to stop and wait and give way to oncoming traffic, so they can all fit past each other in the single lane. The cars wait for the bikes to pass, so they can edge into the cycle lane to go around the oncoming traffic. The bikes always seem to take priority though. It’s such a wonderful place to ride. Even if we have a car or a bus behind us, we don’t feel rushed or pressured, they just calmly wait until they’re able to go around us safely. With bikes such a way of life, all the drivers are “bike smart” and “bike aware” and don’t seem to see them as a nuisance to speed around, but as another form of transport to be respected on the road. It’s wonderful. We cruised along merrily, with the flat path letting us get into a rhythm and keep up a constant cadence and just pedal along, with an easy flowing 1,2…1,2…1,2…as we pushed the pedals and the wheels turned in a nice, metronomic beat. Steve said there’s a downside to having all this flat riding. He says he has to pedal all the time! “I don’t get to free wheel down hills, I have to keep pedalling all day!” Well, I for one can live with that “hardship”! We did have a couple of hills today actually. Well, overpasses really, but when we saw them, it was a shock! A hill! An incline! What’s this? This will not do! That is not Dutch! Fancy being a slope in the path! After all our slogging up hills in France, Spain and Portugal, we are loving these nice flat rides. With the slopes today, we didn’t even have to change gears to get up them, it was just a little blip to break up the flat, but we have become lovingly attached to the flat paths and saw these slight inclines as unwanted guests! 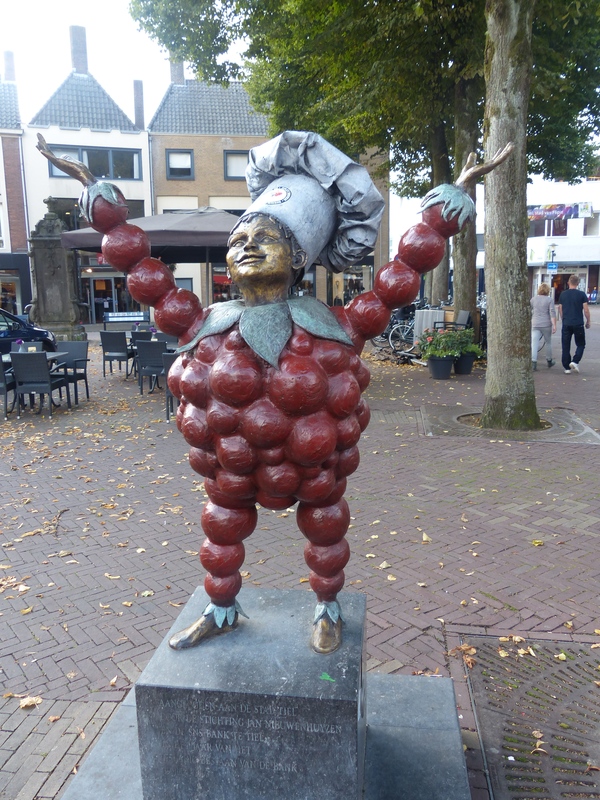 As we rode towards Tiel, we entered the Betuwe, a region known as “the Dutch fruit garden” and we could see why. We rode past acre after acre of orchards, of all manner of fruit. We then came across something that I thought was fantastic. We saw a sign with a picture of a strawberry, advertising a roadside stall. 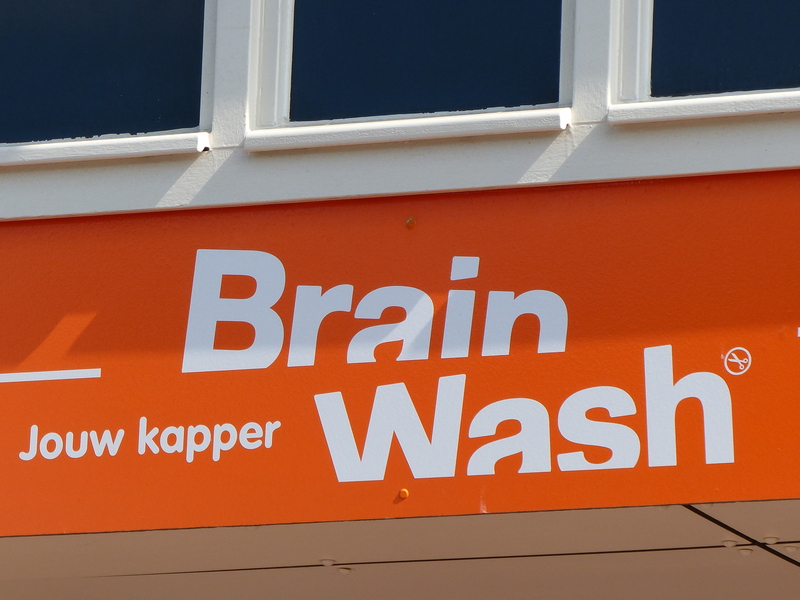 Well, I wasn’t going to go past that, so we pulled in to the small, roadside shed. 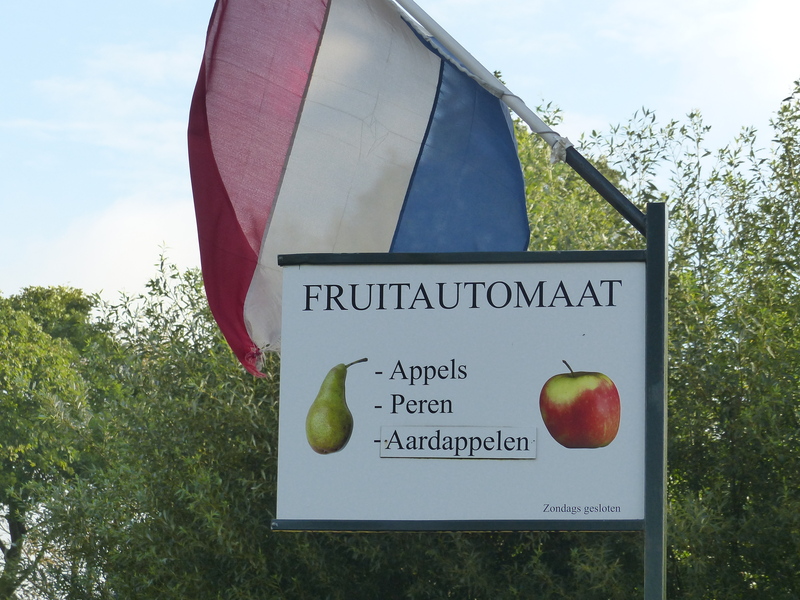 It turned out to be a Fruitautomaat. Inside were the selections of fruit, sitting in their own glass fronted cabinets. 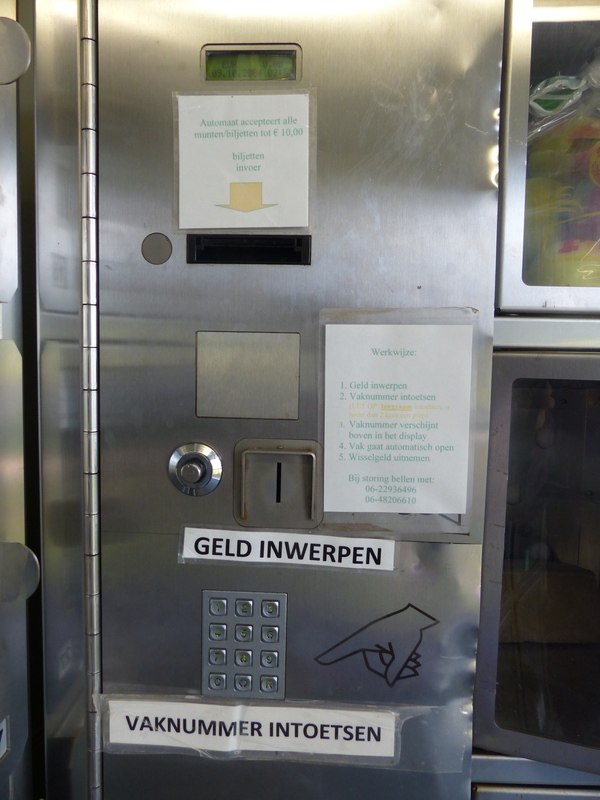 On the wall was a machine, exactly like a vending machine, with a keypad. 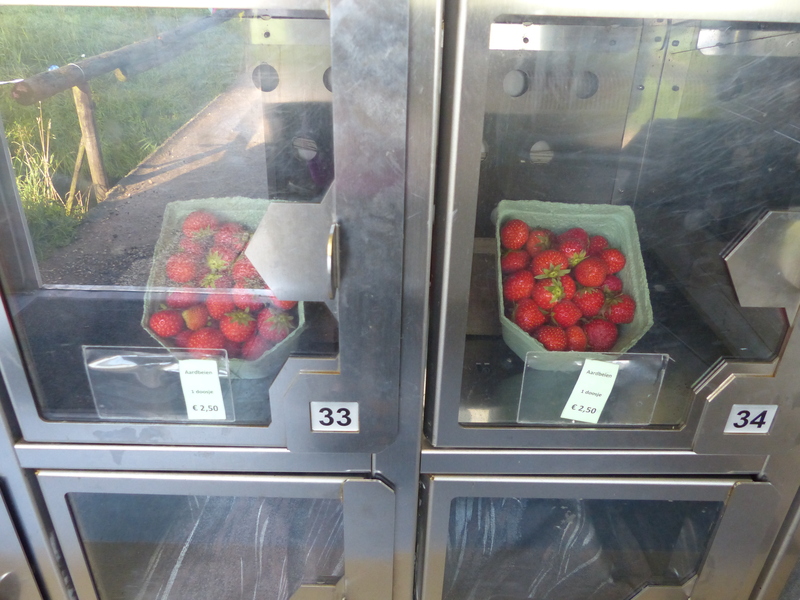 So I put in my 2.50, pressed the numbers for the cabinet I wanted and ‘ping’, the glass door popped open and I could take my punnet of strawberries. It was excellent! 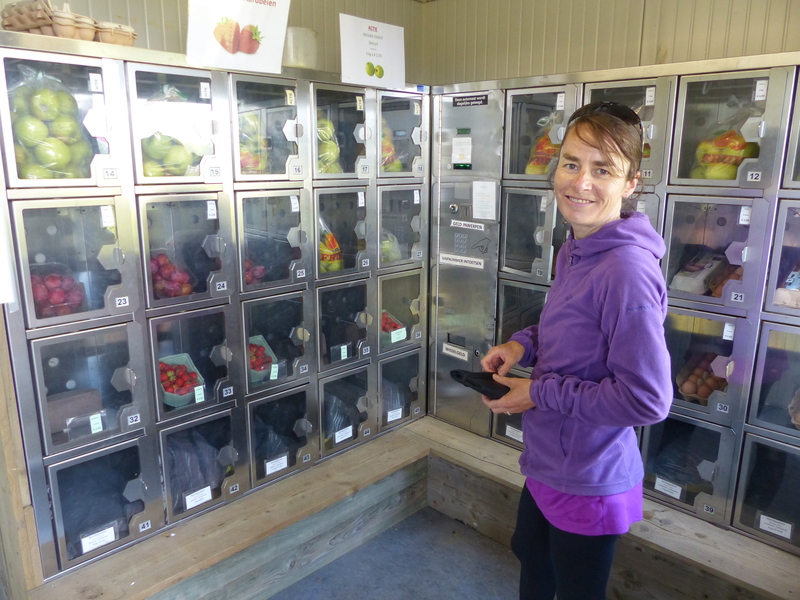 I’ve never experienced a fruit vending machine before, but it was my kinda thing! …then use the vending machine. Fantastic! With my strawberries stowed in a pannier, we pedalled on and came across another roadside stall. This was just a small barrow, sitting on the side of the road, selling plums. I stopped and added a punnet of those to my collection, so elevenses and lunch were sorted! This is just the sort of thing we had imagined doing during our touring, stopping and buying things from roadside stalls and being part of real local experiences and life. On we pedalled. Then, something happened. Steve had his first real crash. I was riding behind him, when I heard him cry out, then he started swerving quite violently, ran off the path, the bike crashed into a fence and Steve went crashing to the ground. I raced up and got down beside him, because from where I was, I was sure he’d hit his head on the fence and he wasn’t wearing a helmet. There was a car behind us and I saw it stop up ahead, waiting to see if Steve was OK. When Steve stood up, the driver was obviously satisfied that all was well and drove off. Steve was OK and he hadn’t hit his head. He said he’d been stung by a bee, that had flown into his face, then got under his sunglasses and stung him under the eye. It was obviously hurting, but there was no sting to be seen, his head was OK and he hadn’t suffered any injury, other than some scrapes and a sore face. So all in all it was a lucky escape. As I was looking at his face and seeing if there was anything that needed to be seen to, the man who lived behind the fence appeared and looked concerned. We couldn’t understand everything he said, but from his tone and gestures he was obviously asking if we were alright and if Steve would like to come in to recover for a while. We thanked him and assured him everything was OK and his parting words were, “Be careful.” He was showing real concern in his face and voice and it was so nice of him to come and check on us. 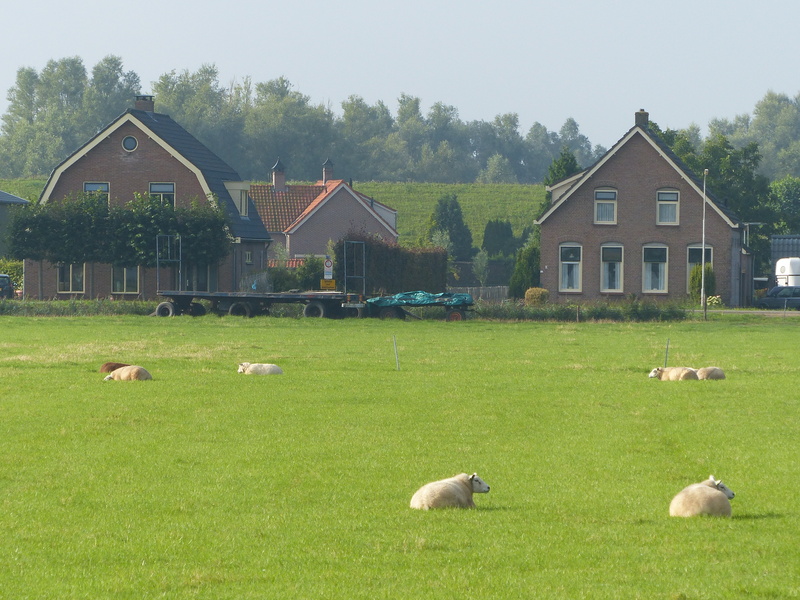 I suggested we stop and sit for a while, but Steve said we were only about 5km from Tiel, so we’d keep going and stop there. We rode into Tiel, pulled up at a bench and I inspected Steve’s face. It was a little red and ever so slightly swollen, where he’d been stung, but nothing too bad at all, thankfully. We stopped at a park for elevenses and Steve got to have a bit of a rest after his fall. 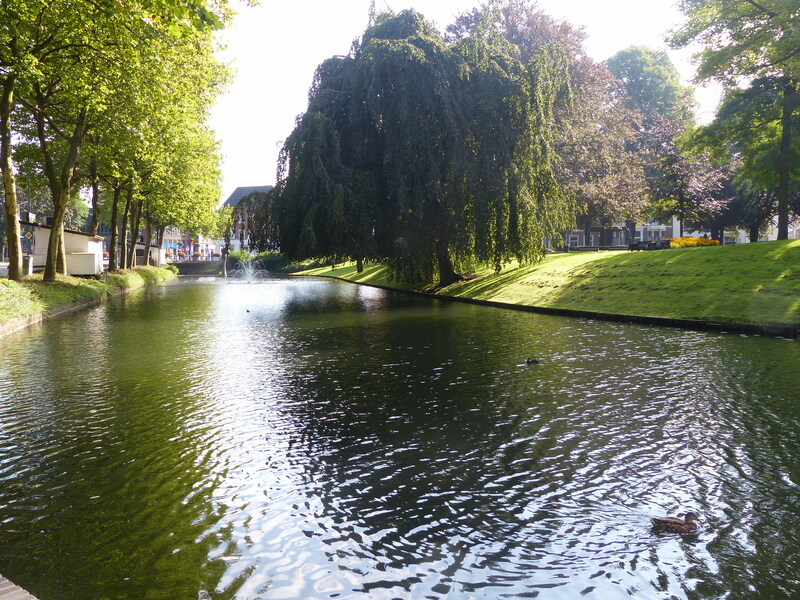 Then we strolled through Tiel, before heading to the wharf, where we needed to take the ferry across the river. As we stood on the deck of the ferry, slowly chugging the short distance across the water, a young girl approached us and spoke to us. I apologised for not understanding her, so she switched to English and pointed at our load and asked how long we were travelling for. I told her a year and where we’d been and how much we were loving her country. “Oh, what is it you like about England?” I asked. I don’t know if she’d been there or not, or she just loved the images and idea of England, but she was definitely taken with it compared to her own place. We continued chatting and she was so friendly and just another example of the delightful people we’ve been meeting. She was probably about fourteen or fifteen years old, and for her to be friendly and interested enough to strike up a conversation with a couple of strangers, I thought was just wonderful. When we rode off the ferry, we found a map by the road with the cycle network shown, so we stopped to write down our numbers again, so we could follow them in order for our onward pedal. We rode through more beautiful countryside and passed people who gave us a wave and a smile. 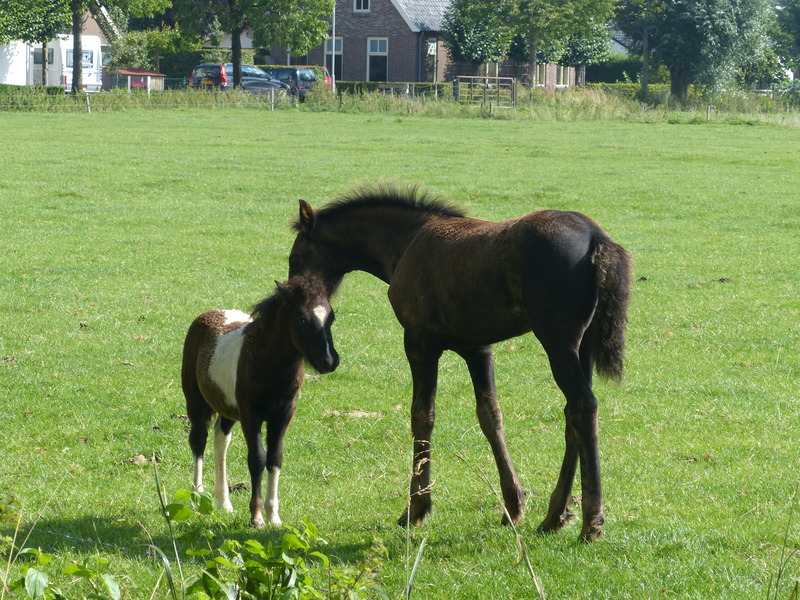 The Netherlands must be a very horsey country because there are paddocks of horses everywhere. I stopped to take a picture of some that were in a paddock with some goats. I’d taken a few pics, when I thought, I’d better take a photo of the goats too. Just as I thought that, I heard, “Maaaaaaa” and one of the goats had walked up towards the fence, looked me in the eye and made its thoughts known that I had taken an interest in the equine members of the paddock and ignored the goats! 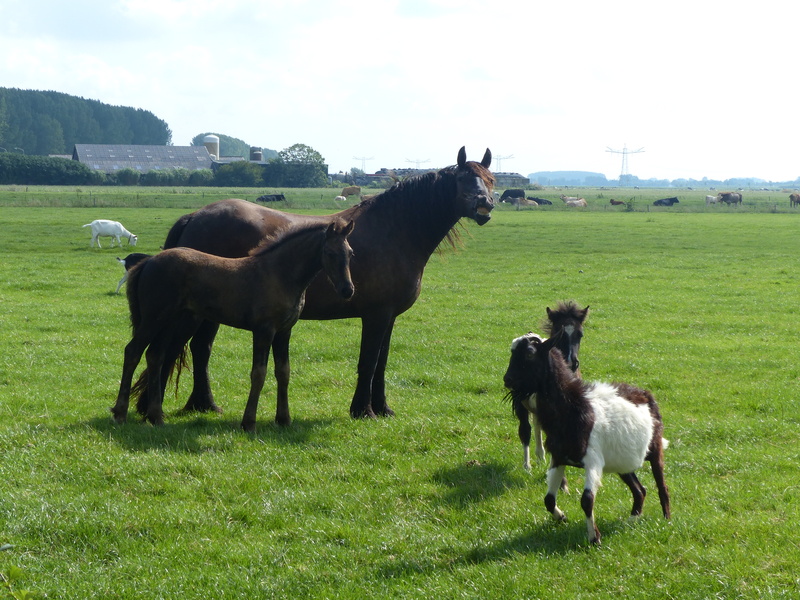 “You’re absolutely right,” I replied, “how rude of me, you deserve your portrait taken too!” As I was talking and photographing the goat though, the other horses wandered up and decided they needed to be in the shot again too (hogging the limelight!) 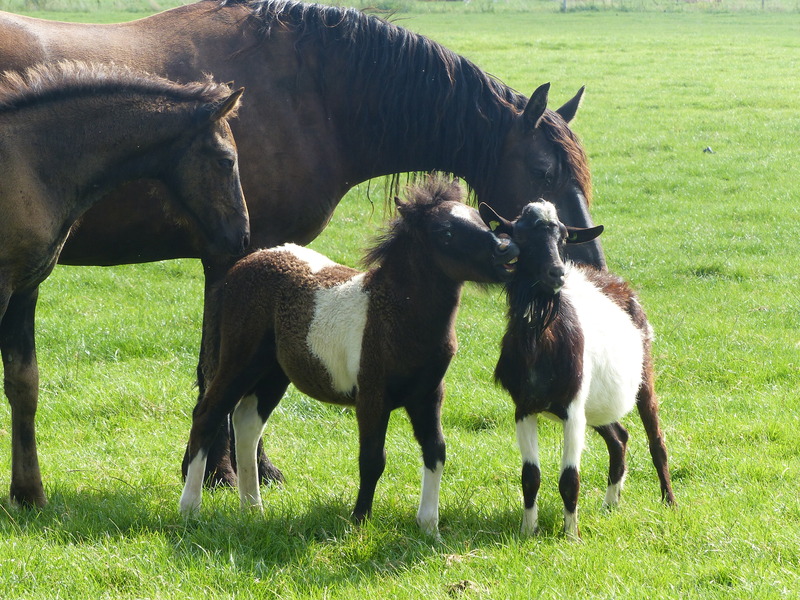 and then all of them stood and had a little chat, before one of the foals decided to play chasings with the goat, who was just the right size for a fair match. It was such a comic scene to watch. …before a game of tag! On we rode and wheeled into Oss, where we stopped for lunch. We had planned to find a campsite today and get back into our little tent, but when we started talking about where to head next, Steve said, “I don’t feel like camping in this wind.” The wind had been blowing pretty strong all day and into our faces. “We have the wind all day riding, and I don’t feel like putting up with it all night in the tent too,” he added. Fair enough. OK, let’s go with solid walls again. We did some research and found a place about 5km away, so we set off there. 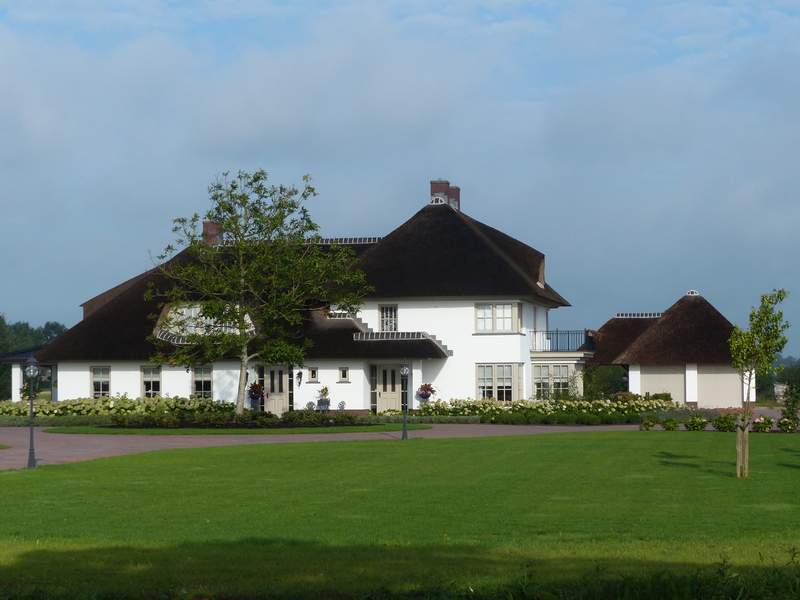 We’re once again in a hotel, a nice one near a forest and with a bike shed where our bikes are safely stored. 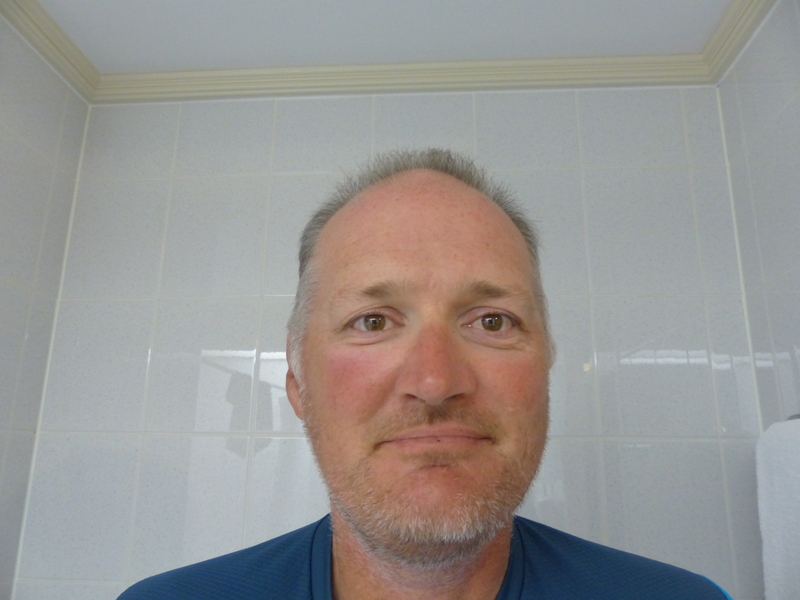 We settled in and we checked Steve’s face again, which looked OK, just a little red and a slightly puffy spot, but not swollen thank goodness. Despite the bit of drama with Steve’s crash and fall, it was another great day and a super enjoyable ride. More beautiful scenery and friendly people to make our day a delightful one. What a top place to ride. What a gorgeous country. It’s beaut, bonza and brilliant and we’re havin’ a ball!